I seem to recall that you were talking about this dream kitchen a while back and I’ve looked high and low through your website and don’t see too many images of the outcome. Would love to see the results. You’re not the only one who’s been asking about the dream kitchen. It’s a bit difficult for me to talk about. Something happened but I don’t know what. The only thing I know is that it was made clear to me (but not in so many words) that there are to be no final photos. Right. Bummed doesn’t even begin to cover it. Please don’t try to make sense out of it. Nothing happened that I’m aware. As a matter of fact, my client was incredibly good to me for the 3 years we worked together. I’m very grateful for this job because it came at a time when I needed it most. However, this was my Mr. Holland’s Opus, Babette’s Feast and Rocky all rolled into one glorious once-in-a-career-kind-of-job. I fantasized about styling this wonderful space and possibly hiring a professional photographer this time. Ahhh well… not to be. There is a silver lining, however and that is that something special is happening and I can’t say anything more than that because I’m not allowed to until early April when it’s revealed to the public. In the meantime, I’ve been posting every day on instagram which is a lot of fun. What happened is I dug up some images taken on my cell phone before the kitchen was completely finished. With a little cropping and editing, I think this first one came out pretty okay. I nearly cried because I’ve been dying to show you guys the gorgeous nickel hood exquisitely rendered by Texas Lightsmith. And here it is! In the foreground is my fave Perrin & Rowe polished nickel yum yum faucet. The back splash is a simple slab of Calacatta Gold marble that we drove out to New Jersey to select! This is a very charming but quirky room. There are FIVE doorways! One to the entry, one to the basement, one going upstairs, one to the dining room and a big French door with a transom going outside. And then there are four windows, so very little wall space. In fact, we covered up one window in the now defunct dark, cramped butlers pantry. It just wasn’t working and wasn’t necessary either and it allowed us to have our pantry/fridge/freezer wall flanking the entrance into the dining room. The kitchen now opened up seems far larger but this is not a huge football field of a kitchen. I think the size is perfect! Another shot showing where the built in fridge and freezer clad in their gleaming cabinetry created by Jem Woodworking. The island counter is once again the magnificent Calacatta Gold marble. A closeup of the unusual fridge and freezer handles in polished nickel. I love these because they remind me of old silver. I felt they were perfect for this home which had just celebrated its 100th birthday in 2010. You might enjoy looking at this post which shows several shots of the kitchen in progress as the cabinets were being installed. One of the two original Palladian windows with more of the Calacatta Gold marble back splash; this time in a brick pattern. Please note that these are the only two overhead cabinets. The counters are a quartz composite. I often do two different materials for the perimeter counters and island counters. Above, a shot from the (duh) window treatment install. Here you can see the two new Palladian windows made to match precisely the original windows! You should’ve seen what was here before. Someone had stuck an ersatz Palladian window that was way too big and not centered on anything! It was weird and drafty and we couldn’t wait to get rid of it! And yes, that is a view of the workers’ Port-O-San in Barney Purple. haha! You’ve seen this one before but it’s everyone’s favorite part of the kitchen, along with the custom-made sconces from Canopy Designs. I found the escutcheons (don’t you just love that word?) online and had them painted to match the cabinets. We also painted the brass carved bin pulls. I love the white on white! Oh, you want to know WHAT color white? I love white dove because it is the perfect chameleon off-white. It is both warm and cool, soft and creamy without being too yellow. But on occasion, the yellow comes out more and sometimes it looks very white, so please as always—test your colors! A shot after I hand-painted the chandelier over the table. I love doing that sort of thing except looking up makes me dizzy and nauseous so I had to come by three times to finish the job! I used some simple acrylic gold craft paint that I got at a good hardware store. I just brushed it on! We did replace the candle sleeves with authentic beeswax candle sleeves. It’s a little fuzzy. It was a gray day but at least we have this! Chair fabric is Brunschwig et Fils Le Lac but laminated because at 8 million dollars a yard, we need to protect it. It looks like a chintz and you can wipe the chairs down now! We did this sunburst mirror over the doorway to the dining room and a larger one over the TV but I don’t have a shot of that. And a newly edited shot from the dining room. We copied the coffered ceiling in here for the kitchen ceiling. This shot was taken with my Canon, so better than most of the cell phone pics. At least I have them and now you do too! I’m still planning on the Sunday post. I miss my mid-week post and will try to get it in when possible. So many good things on the horizon and I can’t wait to share them all with you! The Answer To Your Prayers – 15 No Fail Interior Paint Colors! I just love your blog. I’m about to have my kitchen cabinets painted by brush and the paint store now said I shouldn’t use satin impervo oil base but use BM advance satin paint for my black island and Elmira white cabinets. What are your thoughts on this change? I love what you did with this kitchen. I have a house of similar age (1919) and was wondering where you found the silver handles for the fridge and freezer doors? I love that they nod to Art Deco, but aren’t over the top. It’s a digital PDF, meaning that after you purchase it, you download it and can view it on your device(s). However, some people have printed them out. OR, there are services which will do that for you and I understand that they aren’t expensive. Here is a link for some of them if that’s of interest to you. One of the primary reasons for doing it in this manner aside from being far easier is that I can do updates without releasing a new edition which would mean another fee, of course. To die for, Laurel, truly! That hood is just plain magic, and those ceilings and the rest of the woodwork and hardware… absolutely divine. When I was about 10, my mother hired a designer to do our new house, and that was about when my obsession with design started, literally sitting at their knees. I had this to-die-for fabric in my bedroom that they did both the bedspread as well as both window curtains and even a shower curtain out of for the bathroom. It had to be treated somehow for the bathroom, obviously, because I do actually remember parts of that discussion, although no further details, but it was a very early lesson in how you can almost always have the most gorgeous fabrics possible in places you never thought you could because of what they are made of and what they have to hold up to. I am a huge, huge fan of treating them for places like kitchens and when there are little kids and old people. 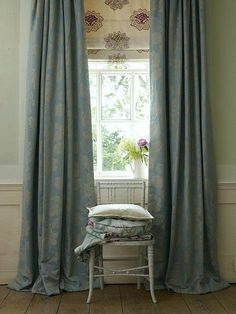 My obsession with keeping the place clean as a whistle (in between the housekeeper’s efforts) eventually waned, but those curtains held up incredibly well and were always stunning despite all of the moisture. Clearly no one was doing much with ventilation and moisture extraction in old houses in the 60s, so it really always got hit, and there was never the slightest hint of a problem. I think that by the time my mom sold the place when I was around 30, the curtains had started to fall apart, but that was a pretty long run, particularly with the moisture. What a great story! I love that you got your fabric and the air conditioning. I have a feeling that your mom preferred that fabric too and was just trying to be frugal. Thank you for that. I had to do some creative editing on all of them to take out things like dangling cords flopping out of the walls, etc. In one image, there were a bunch of boards piled up in the doorway and I got rid of those too! I adore the Dining Room!! Did you get any other shots? Why fabric did you use on the chairs? And that WALLPAPER!!! What is that gorgeous thing called? Did you also paint the Dining Room chairs? Needless to say—–your kitchen is dreamy. Come to Alabama, please! Thank you! There are some other shots in my portfolio. 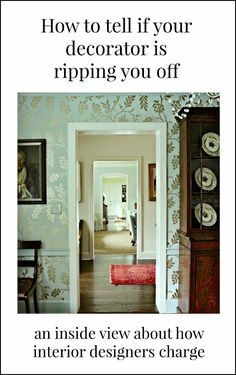 The wallpaper is from Thibaut. Chairs from Aidan Gray and they came that color. The fabric is from Quadrille. I am so inspired by your vision and creativity. What a lovely kitchen! Thank you! You had SEVEN doors!? That’s crazy time! Actually, around here, open concept is not very common. In my town, all of the homes are old. If anything though, they are the old tired traditional with lots of dusty swags and cheap sheers. I recommended a cabinet maker that I had the taste level to interpret the designs and a wonderful GC who created that magnificent coffered ceiling! This is funny, but yes, I do have a place that I love for all kinds of fabrics. Boy, someone must’ve slipped me some sodium pentathol! lol But really, at this stage of my life, especially, I am so happy to share what I know! But here’s what’s funny. It’s Norbar Fabrics and they are located in Boca Raton! I have ordered thousands of yards of fabric from them. Maybe millions by this point! It’s my go-too for reasonably priced linens especially, but they a lot of awesome fabrics. Some of it is not awesome but it’s a huge line. There’s something for everyone from elegant to tres tacky. lol But it’s a great company! Oh gawd. I swear, I didn’t read down to the very bottom of your comment before I dove in! hahaha. tooooo funny! You already know them! But yes, they have a very nice line of vinyls. Thank you so much! Both White Dove and Cotton Balls are great colors. When I did my post on the one color that goes with everything, I chose cotton because WD in a few instances can go a little too yellow. Not usually, but it can. On the other hand, it has the edge over Cotton with deeper colors because of that. So, WD is in the number 2 spot but only by a little. Also, certain colors like very clear yellows and blues might not work as well with white dove. It all depends on the light. I don’t think it could ever be terrible, however. Yes. I would like to move and I’m not joking one little bit. I just don’t know where I’d like to move to. This might sound funny as I feel so incredibly loved, but I don’t have any very close friends. My BFF died a year ago. Still can’t believe it even though I knew it was coming. Aside from that, there would need to be gorgeous architecture and a good ballet class. I still dance for fun and exercise. It’s been a lifelong passion of mine and if anything has only gotten stronger as the dancers have become so phenomenal! I love the idea of Charleston, Savannah or NOLA. I’ve never been to any of them. Wherever the people are the nicest. My new home would be white, white, white! We did the pulls in two different sizes. I don’t remember exactly but I think one was about 5 inches and the other about 8. The latter went mostly on the appliance drawers in the island. It’s way cool but no photo of that. We did the fridge handles. We chose a knob (or I did, rather) from Shaub but not in that collection. Funny… I just used a Forrest Gump line and then, “there she was.” Sorry. :] Flowers are so beautiful. This one was more of a coincidence. The client wanted a lot of sparkly lighting. I had found these French sconces which were like 2,500 each! So, that wasn’t happening. These were ‘only’ about 900 each! Here’s a whole page of the bague sconces! They are to die for! Thank you so much! Publishing is very nice. I’m not very good about pursuing it and the few times it’s happened hasn’t led to anything. You would think so, but nothing. I’m far better off self-publishing on my website! Loved this kitchen! 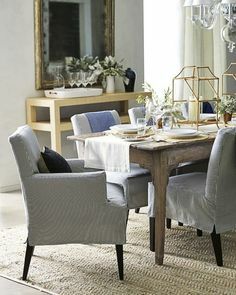 As a Designer and Upholsterer I’d love to know more about that laminated fabric for the dining chairs. Somehow I’ve never heard of this and I feel like it would save me from having to wrap my beautiful fabrics in vinyl at my clients request. If you could share I would appreciate it! Thanks! I love this kitchen. Your choices and direction are perfection. 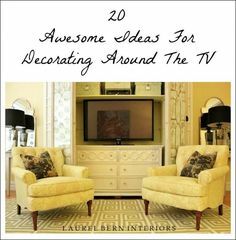 I was a little surprised to see the tv on the wall, but understand totally, as there seems to be a tv in every room these days. I wonder if you could talk them into hanging a hinged piece of beautiful artwork over it? I’m so happy to see this post (what are the chances?) because I JUST came home with my sample kitchen cabinet door and it SO looks like the cabinets in this kitchen. I’m even doing the quartz, and Calacatta gold marble backsplash. I like the look of white Shaker cabinets but mine will be a warm white and have some soft details. This kitchen is beautiful and warm right down to the floor. Selecting everything is overwhelming and I feel so reassured that I’m not making any gross, costly mistakes. I was filled with excitement when I saw this kitchen – I hit the real jackpot! Thank you Lisa! I wish I had before photos. The kitchen was so dark and it was wrong for the house. It was in a French Provincial style and the home is totally Beaux Arts neo-classical down to the ionic columns in the front to back center hall! I have a question about your rule of thumb on paint finishes. Do you recommend using a satin sheen on cabinets and trim? White Dove is my color choice, too! The kitchen is beautiful! Every photo is wonderful! I am wondering about the laminated chair cushions–is it a matte finish or more glossy? Do you think the chairs are comfortable with a laminated fabric? Hi Laurel! LOVE, LOVE, LOVE THIS ROOM! Everything is white dove – semi-gloss. It is hand-painted on site which took them about three weeks. It’s very labor intensive because it’s many layers which get dried and lightly sanded. The result is a very smooth lustrous, durable finish. Laurel …. LOVE the dream kitchen you designed. Would you be able to share the wallpaper manufacturer/pattern ?? Absolutely adore it and it would work perfectly for us. I so enjoy your talents and you are generous to share on your blog !! Love white on white. That nickel hood is so perfect. I forget sometimes because I’ve been doing this so long, but here’s how it works. The fabric and it has to be a fairly smooth weave gets sent out before it’s upholstered. I use Schneider Banks in Texas. Awwww… I had a kitty who died 13 months ago. I miss him insanely but he was trashing my furniture! So, I understand. If their claws are sharp it is possible to puncture the plastic coating, otherwise, you should be okay. In addition, there are a lot of really great vinyl fabrics on the market. I use those sometimes for kitchen chairs or banquettes. Some of them even look like linen and have and almost clothlike feel.